UP stray cattle crisis: Police start closing cases against angry farmers. 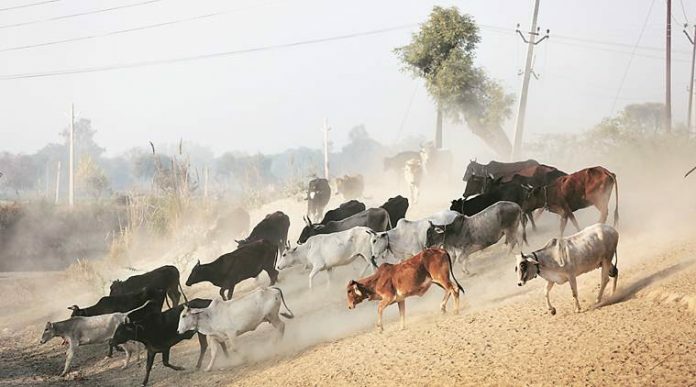 So dire is the stray cattle crisis in Uttar Pradesh that in several districts, cases filed against farmers for abandoning their cattle are hitting a roadblock of public resentment and anger. From Auraiya to Shamli, Shahjahanpur to Hathras, police are filing closure reports in cases filed against farmers, witnesses are not turning up and in many cases, “informal” arrangements are being struck to ensure that farmers don’t face penal action. What followed, however, was a meeting between the staff and the villagers organised by police. “The next day, police called the villagers and held a meeting with the school staff. The villagers claimed they were not involved and that those who had assaulted the staff were from neighbouring areas. But they admitted to having herded the cattle to the school and apologised. Since they apologised, the issue was resolved there itself. Police from the local (Phaphund) station, including the station in-charge and the investigating officer, were present at the meeting,” said Chand. When contacted, the investigating officer, Sub-inspector Mohammad Shakir, claimed that he closed the case after the principal “himself gave in writing that he did not want any action”. The FIR on Chand’s complaint had been lodged against nine unidentified persons under IPC sections 332 (voluntarily causing hurt to deter public servant from discharge of duty), 353 (assault or criminal force to deter public servant from discharge of duty) and 504 (intentional insult to provoke breach of peace). According to the FIR, a group of farmers from the village carrying sticks herded the stray cattle into the school. The group assaulted the school staff and the principal, who was recording videos of the incident along with another teacher on their cellphones, it stated. By the time police arrived, the farmers had left but after ransacking the school office, the FIR alleged. “The issue was resolved and complainant himself was not interested in police initiating any action,” said Auraiya SP, Triveni Singh. Chand said he will “not contest the closure report in court”. AGRA: On February 4, an FIR named 19 persons and 106 unidentified others for herding stray cattle inside a government primary school in Budauli village. No arrest has been made so far. “The farmers had herded stray cattle inside the school last Saturday and Sunday. We registered the case under the Prevention of Cruelty to Animals Act,” said Station House Officer (Tajganj), Pravesh Kumar. SHAMLI: Police have arrested one of four accused in an FIR lodged under the Prevention of Cruelty to Animals Act after farmers herded stray cattle inside a government higher secondary school’s premises on January 28. The farmers forced the staff to hold classes in the open while the cattle were locked inside, stated the FIR. “The arrested accused, Pawanvir, was released on bail the same day,” said SP Shamli, Ajay Kumar. SHAHJAHANPUR: Police are trying to locate 28 farmers who locked up cattle inside a government primary school after breaking the lock of its main gate at Nagaria Bhujurgh village on January 2. An FIR named eight persons and 20 unidentified others on charges under the Prevention of Cruelty to Animals Act and Prevention of Damage to Public Property Act. On January 3, the principal reached the school to find a “large number” of cattle inside, and the students standing outside. “A few farmers removed the cattle later,” said Circle Officer (Jalalabad), Shiv Prasad Dubey. HATHRAS: Police have not been able to identify a group of farmers that herded stray cattle inside a government primary school at Pateni village on December 27. The case was filed against unidentified persons under the Prevention of Cruelty to Animals Act. “We are trying to identify the accused,” said Station House Officer (Mursan), Yogesh Sirohi.